Expedia.com has revealed the results of a study, conducted by Northstar that examined American attitudes towards weddings. Expedia's 2014 American Altar Report found that Americans find traditional wedding planning to be hugely stressful, ranking it ahead of such stress-drivers as paying taxes, going for job interviews and taking driving tests. Eighty-four percent of Americans believe that destination weddings are more fun, and among those who have had a destination wedding, 76 percent believe they are far less stressful than traditional ceremonies. Forty-two percent of married Americans, if given the chance for an "I Do-Over," would choose a destination wedding the second time around. That figure jumps to 63 percent among Americans under 35 years of age. A full 67 percent of married Americans say they are likely to renew their vows at some point during their marriage. An equal proportion of Americans (67 percent) report that if they were to ever renew their marriage vows, they would choose a destination ceremony. Couples who have had a destination wedding report that "easier to plan" (37 percent) and "less stressful" (48 percent) rank among the potential benefits of planning a destination wedding. In comparative terms, traditional weddings fared poorly in the 2014 American Altar Report, with "long church ceremonies" (32 percent), "experiencing the same rituals over and over" (26 percent) and traditional weddings' failure to feel "unique or special" (25 percent) among the top list of gripes. Should destination wedding guests be expected to give a gift? The study found that Americans spend approximately $103 on wedding gifts, for both traditional and destination ceremonies. Forty-four percent believe a "smaller gift" is appropriate at a destination wedding. Is "no gifts expected" a binding request? It appears not; 66 percent of Americans report that they would bring a gift even if the invite advised against them. Should Americans pay for the travel costs of their destination wedding guests? America was roughly split in response: 47 percent of Americans believe that hotel costs should be covered by the wedding hosts. Forty-three percent say meals should be completely covered. Thirty-one percent expressed the belief that flights should also be paid for. Sixty-two percent of Americans say a flight up to six hours is an acceptable distance to travel for a destination wedding. And 51 percent of Americans believe the couple should give guests at least seven months' notice. Cost: 68 percent of Americans believe that planning and hosting a destination wedding would be more expensive than a traditional wedding. Turnout: 42 percent cite being "afraid guests won't come" as the primary reason dissuading them from a destination wedding. The perceived lower-stress option of a destination wedding has emotional implications for participants. Fifty-four percent of survey respondents agree that "you are less likely to come across a Bridezilla at a destination wedding." And opportunities for romance are perceived to be more plentiful - 50 percent of Americans aged 18 to 34 believe the likelihood of becoming romantically involved is greater at a destination wedding. Expedia's American Altar Report found that beaches are perceived as the ideal location for a destination wedding, with 43 percent citing it as their preference. Among beach destinations, Hawaii (30 percent) topped the list, with the Caribbean (22 percent) placing second. Mountain lodges and vineyard/countryside venues tied for second, at 18 percent. This study was conducted on behalf of Expedia by Northstar, a globally integrated strategic insights consulting firm, among 1,000 adult Americans. Surveys were completed between February 7 and February 12, 2014. Sampling quotas and weighting were used to ensure the sample is representative of the US population in terms of age, gender, region, household income and household composition. Assuming a probability sample, the margin of error would be +/-3.1 percentage points, 19 times out of 20. The long awaited 2013 Marriage License Statistics are now out! 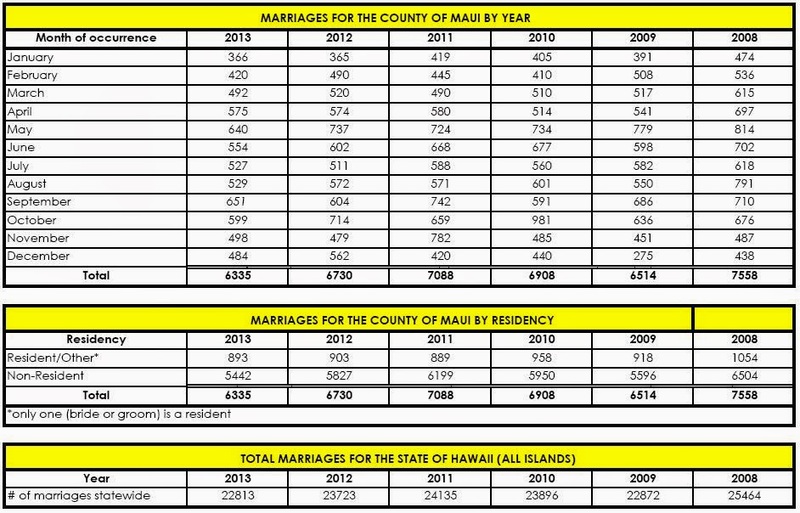 Overall the statistics are pretty steady although it looks like weddings in Maui have been on the decline by 300 weddings a year since 2011. Weddings are off about 1200 from the hay-days of 2008. The number of marriages in Maui are directly related to the economy. Hawaii is the last to see an increase in revenues and the first to see them decline. If the economy goes South, you can bet that fewer people will be coming here to be married. It looks like the confidence in the economy has yet to reach us here in the Maui wedding industry. Preliminary data from wedding planners this year are showing an increase for wedding bookings in 2014. Couples are being cautious with their money though and opting not to spend as much on non-essential wedding extras like video, music and transportation, but are continuing to order items like photography, beauty services and receptions. We are hoping that we see this figures increase in 2014 and hoping that 2013 was the low point... but that all depends on the confidence of consumers in our ability to bounce-back from the failing economy and loss of jobs we have been seeing in past years. For brides and grooms coming to Maui to be married, just be assured that Maui will be one of your best valued wedding destinations now and for years to come. When other mainland wedding venues are raising their rates, Maui remains steady with prices remaining the same from 2011. See you here soon! Sorry I made this graphic so big it ran over the edge, but we are mainly focused on that past few years.